The selected area of Lublin is partly located within the boundaries of the Historic Monument, which marks the area of the most valuable historic sites rich in both tangible and intangible heritage. The area covers architecture from different historical periods, including churches, monasteries, tenement houses, examples of defensive architecture and public utility buildings. The proposed boundary of the historic city area includes four basic units in the spatial development of the historic city: the city within the walls, the castle with the castle grounds (up to the Czechowka river), Krakowskie Przedmiescie in the area of fortification dated the end of the 16th century to the early 17th century, and the Zmigrod Hill. The boundary of the area for modelling was prepared using the ‘Map of the Great Lublin’ from 1928, which includes historic borders of plots which are still in use today to a significant degree. The Urban Timemap is primarily designed for PC’s and Mac’s using any of the available browsers with HTML5 technology. The City of Lublin focused on the most significant phases of a spatial development. They were chosen based on preserved and available archival materials, particularly written material (inventories, descriptions, illustrations), iconographic and cartographic materials. Architectural and archaeological evidence was also analysed. The proposed boundary of the historic city area includes four basic units in the spatial development of the historic city: the city within the walls, the castle with the castle grounds (up to the Czechowka river), Krakowskie Przedmiescie in the area of fortification dated the end of the 16th century to the early 17th century, and the Zmigrod Hill. The specified area is approximately 0.75 km². The most precious and symbolic monuments of the highest historical value are located within the area, dating from the end of the 13th century to the first half of the 20th century. The period of the 13th and early 14th century marks a time of significant transformation in Lublin. These changes proceeded in spite of external threats, such as raids of Ruthenian, Lithuanian and Mongol tribes pestering Lublin and its surroundings. At that time in the Old Town Hill, a gradual process of establishing a new urban settlement under German law was initiated. The first stage of the process was completed in the second half of the 13th century. The change was reflected spatially in the south-west area of the previous settlement along Grodzka Street. The area was distinguished with the following features: a trapezium-shaped market square and the network of streets adapted to terrain conditions and the existing layout. This resulted in the characteristic semicircular and radiating street plan, which is divided in sections filled with bigger plots, some of which are recognizable today. After the Mongol invasion of 1341, the city was surrounded by walls with two gates: Cracow and Grodzka Gates, due to King Casmir the Great. The king also erected a stone hill fort on Castle Hill. The Dominican monastery complex located within the city walls was also extended at this time. 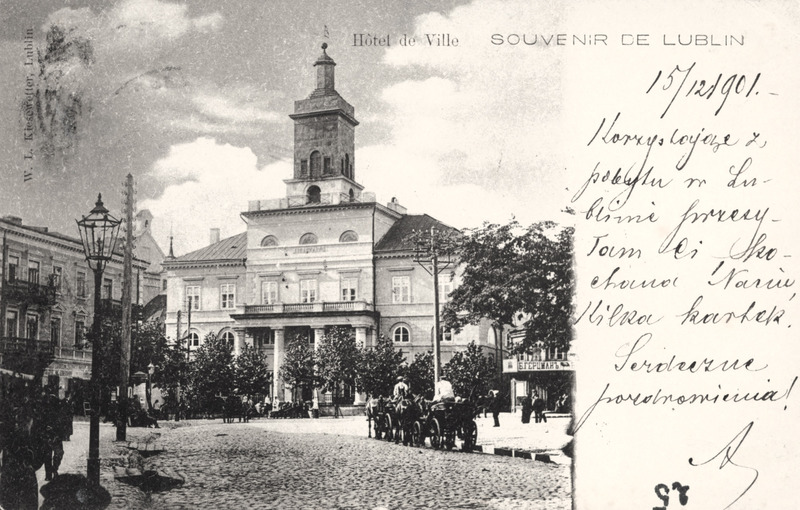 Lublin became an attractive destination for newcomers due to the trade privileges obtained by the burghers. For example, in 1392 and 1448, four fairs a year were established. Moreover, the city was situated on the trade route between Eastern and Western Europe, on the way from Cracow to Vilnius. Together with new settlers of various nationalities, Jews arrived in Lublin around the middle of the 15th century and resided at the foot of the Castle Hill, within or close to Podzamcze – the already existing settlement supplying the castle. The influx of newcomers affected the development of suburbs, especially its western part, the so-called Krakowskie Przedmieście. Within its limits new churches and municipal institutions were founded: the Church of Our Lady of Victory along with the Brigittine Convent (a votive offering of King Ladislaus Jagiello for the victorious battle of Grundwald), the Church of Holy Spirit with an adjacent hospital, and the Bernardin church and monastery. Development in this area was irregular and scattered at the time. Within the suburbs, mostly in agricultural areas situated by the Czechówka and Bystrzyca Rivers, operated royal and alderman’s mills, breweries and malting facilities. New land for development was designated along Krakowskie Przedmieście, from the Cracow Gate towards the new defensive line. At the foot of the Old Town Hill and castle, a small settlement grew inhabited both by Jews and Christians (Podzamcze). The end of the 15th century and the 16th century is known as the Golden Age of Lublin. In 1578 Lublin became the seat of the Crown Tribunal – the supreme court of appeal for the nobility of Malopolska. This fact largely influenced the development of the city, especially its suburbs. In the subsequent two centuries the inner city did not undergo any fundamental changes, however it slowly began to decline. The city walls fell into disrepair and there were no funds to improve their condition. 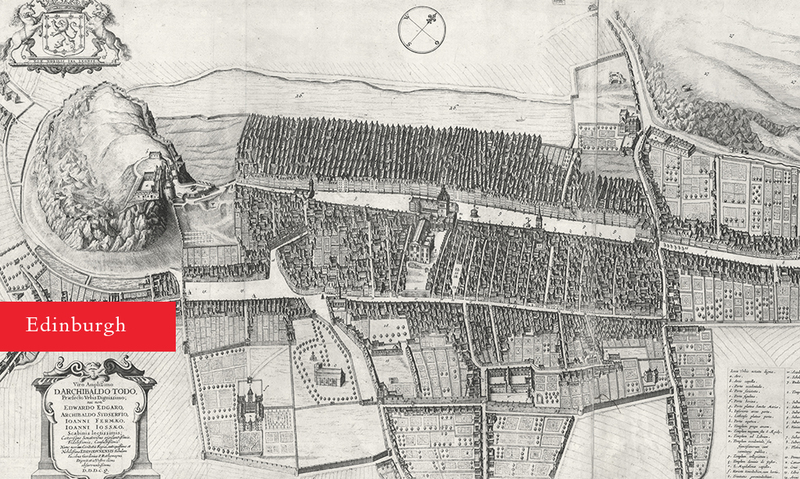 In the first quarter of the 17th century, the earth-and-wood fortifications were extended. The new line of embankments, including a new gate, was moved 200 meters westward. At the end of the 17th century, another line of city fortifications with a number of earth-and-brick bastions were located further west, along today’s Lipowa Street. Lublin in the 17th century was a densely populated settlement composed of the inner city and the suburbs with boroughs and farms. The suburban development was encouraged by the nobility and magnates attracted to Lublin by the institutions of the Crown Tribunal. Their residences were mostly detached minor houses built on sizeable parcels of land surrounded by gardens. In the second half of the 17th century, new houses and several churches were built in the suburbs: the Reformed Franciscans, Brothers Hospitallers of St. John of God, and the Carmelite Order. 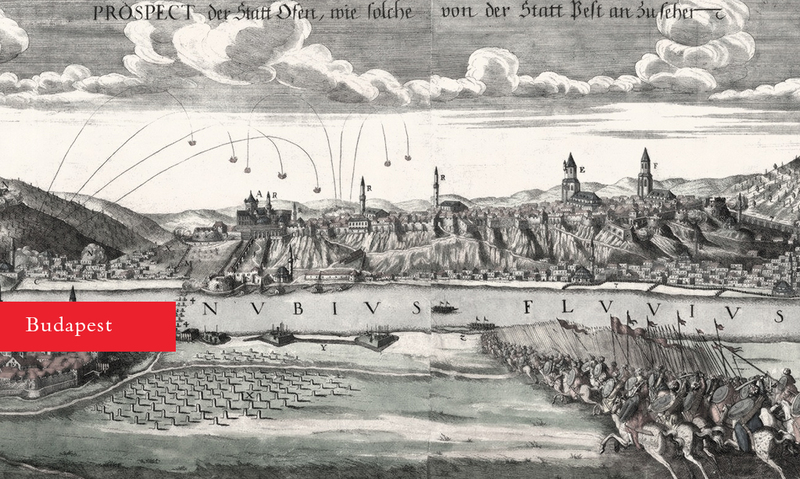 In the early 18th century, Lublin experienced warfare, fires, the plague, and a precipitous decline in trade. Despite hardship, the nobility kept on founding new religious buildings: the Capuchin and Visitandine churches in Krakowskie Przedmieście, the church of Missionary Brothers in Żmigród, and the Trinitian church in the inner city. At the end of the 18th century, the medieval defence walls were demolished. In the 1820s, the urban street system in the old suburbs was redeveloped. The routes to Lubartów, Warsaw and Zamość, which converged in front of the Cracow Gate, provided a skeleton structure for the new system. The Warsaw route, created by the extension of the existing Krakowskie Przedmieście, became the heart of the future city centre and significantly influenced the formation of the newly developed urban layout. New city squares emerged outside the medieval city walls, including one in front of the Jesuit church, by the new town hall, and the military square, a forerunner of today’s Litewski Square. To the west, past the line of 17th century fortifications, the axis of the central street ends at a municipal park called the Saxon Garden which was created in1837. In the first half of the 19th century, industrial sites were scattered around the city as most factories and small plants were located in built-up suburbs. The intensive growth of industry in the second half of the 19th century was concentrated in areas outside Lublin’s historical boundaries, in the vicinity of the railway line which opened in 1877 on the right side of the Bystrzyca River. Only the scales factory of W. Hess was located in the northern part of Lublin, along the Lubartów route, at the considerable distance from the railway. The square was created as a fair in the early 17th century at the crossroads of the main routeto Kraków replacingdestroyed fortification parts. The main product on offer was grain so the place was called “Korce” from the name of an old unit of measurement. We know how the place looked due to the one of the oldest map of Lublin – ‘The Krakowska Gate Area’ by Karol Bekiewicz, dated ca. 1650. Today’s square was created after World War II. The New City Hall was built on the site of the church and monastery complex of the Discalced Carmelite Order which had been destroyed by fire in 1821. The city authorities purchased the ruined property and in the years 1827-1828 converted it into a new city hall designed by Aleksander Groffe. The building is the seat of the authorities of the Municipality of Lublin, including the Mayor of the City of Lublin. Built after 1341 as an entrance gate from the direction of Cracow, it served defensive, commercial and housing functions. The restoration carried out in the years 1959-1964 gave the gate its current appearance. The wall facing the Old Town has the painting of St. Anthony, the city’s patron saint since 1839. Presently the building is home to the Lublin History Museum. According to most researchers, the construction of the church of the Holy Spirit was completed in1419. The original layout and furnishing of the church remains unknown; according to some sources from the very beginning it was a brick building. Fires of 1575 (the Great Fire of Lublin) and 1602 contributed to the poor condition of the church and hospital. The church was restructured architecturally after 1623, probably thanks to Jan Cangerle, a Lublin mason, who is also credited with part of the stucco decoration and covering the chancel with a dome on the oval plan. 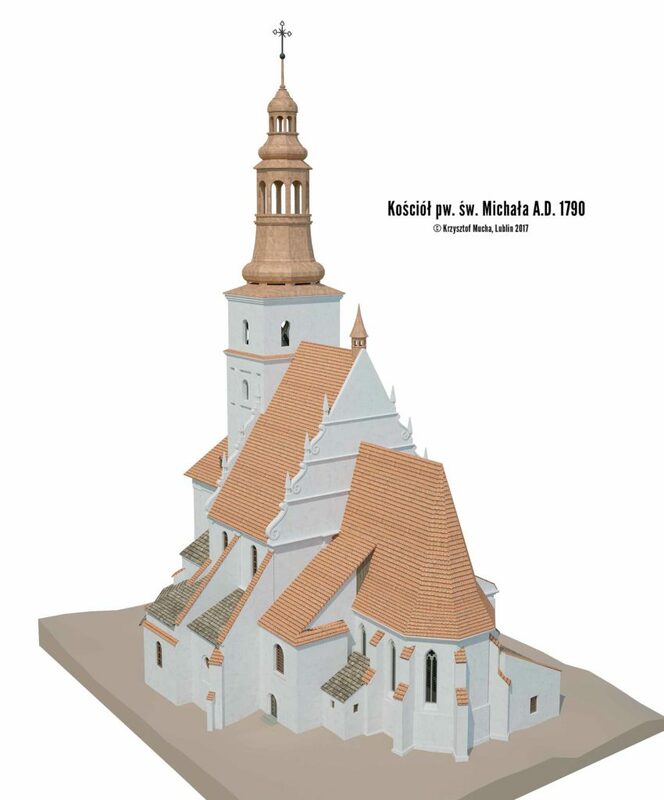 Further reconstruction of the church took place after another fire in 1733. At that time, the walls of the central nave were heightened, transforming the hall church into a basilica. In addition, the towers were heightened and a baroque gable with pilasters curving inwards was added. Paweł A. Fontana was probably responsible forthese changes. In 1846, the church tower acquired the pyramid helmet. Hospital buildings and Brama Świętoduska (Świętoduska Gate) were almost entirely dismantled in 1858. 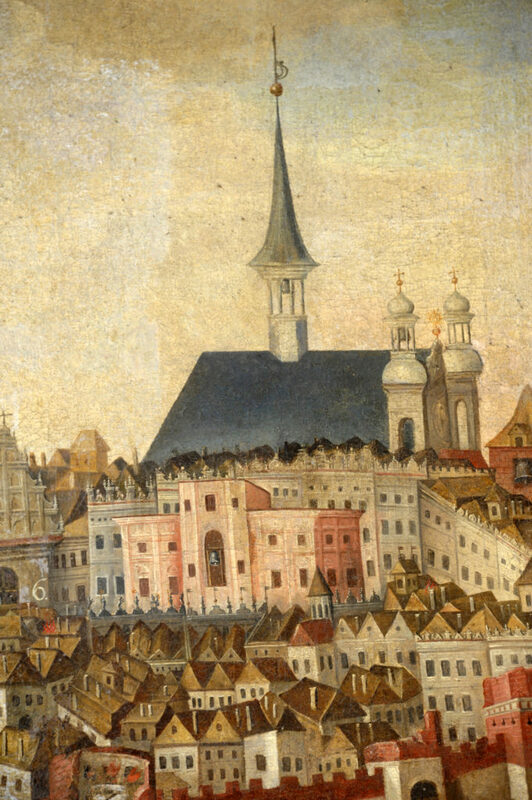 A trapezium shaped market square and a network of streets adapted to terrain conditions and existing layout were created after 1317, when Lublin got the Magdeburg rights (a type of city location law). In the 16th century, houses around the market square gained broad fronted facades with Gothic and Renaissance decorations. Today, the original buildings are in part preserved. The brick Old Town Hall was built between 1408-1419. In 1578 it became the seat of the Crown Tribunal for the region of Małopolska. The present neo-classical exterior and interior design of the building date back to 1781-1787 when comprehensive renovation by the Italian architect Domenico Merlini took place. Known as the townhouse of the Lubomelski family after its 16th century owners, it presently houses the Fortuna Cellar museum. The interior features unique 16th century wall paintings and polychromes depicting religious subjects (e.g. Mother of God with Child in the ground floor room) and secular scenes(in the old winery in the cellar). The framed, painted scenes illustrate the Latin quotations inscribed on the walls that are taken from the works of Horace, Virgil and Cato. Originally erected in 1512, the townhouse was rebuilt and altered over the centuries. At the turn of the 17th century, the facade was embellished with Mannerist decorations including images of the owners and a house mark. Among preserved historical features are decorative wooden ceilings and half-columns in windows. Presently the building houses a kindergarten. Po Farze square was created next to the Saint Michael parish church in 1857. 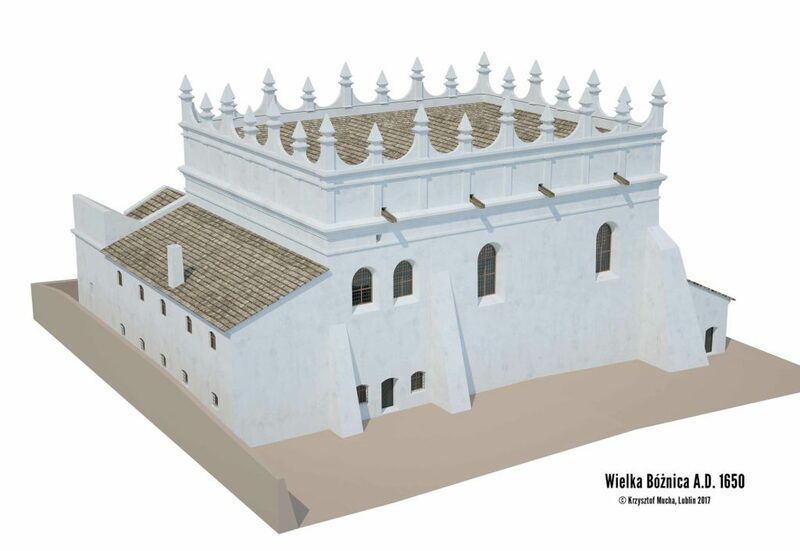 In the 1930’s the foundations of church were discovered and used in 1991 as a model for a reconstruction which reflects the original layout of walls. Built in the 14th century together with the city walls, the gate owes its present appearance to the 1785 reconstruction designed by Domenico Merlini, during which it lost its defensive function and became a residential building. Nowadays it is home to the Grodzka Gate – NN Theatre. According to most researchers, the church was built at the end of the 13th or in the beginning of the 14th century. In any case, it was one of the oldest and most important churches in the city. The building changed shape through the ages: the tower was demolished several times due to the war damages (1341), fires (1575, 1653, 1719) and current renovation works. Despite these works, the church was in a very bad condition, so in 1846 it was scheduled for demolition. Originally Gothic, the church was rebuilt in the 17th century. The décor and furnishings are from the 18h century. Particularly worth seeing are the chapels of the Firlej family, the Tyszkiewicz family and of Our Lady of Perpetual Help, and the 18th century painting “The Fire of Lublin of 1719”. The church enshrines the remnants of the True Cross, some of which were irretrievably lost due to theft in 1991. 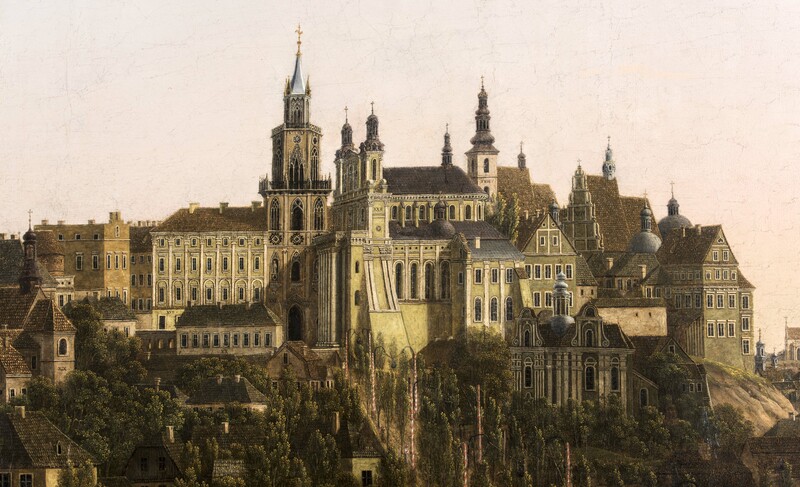 The church and the monastery are honoured with a European Heritage Label as a witness of signing the Union of Lublin. Cathedral Square is one of the city squares marked out the medieval city walls until the mid-19th century along the axis of Krakowskie Przedmieście and its extention towards the former Korce, on the site of the demolished Jesuit College. The remains of the College walls were used to pave the square. 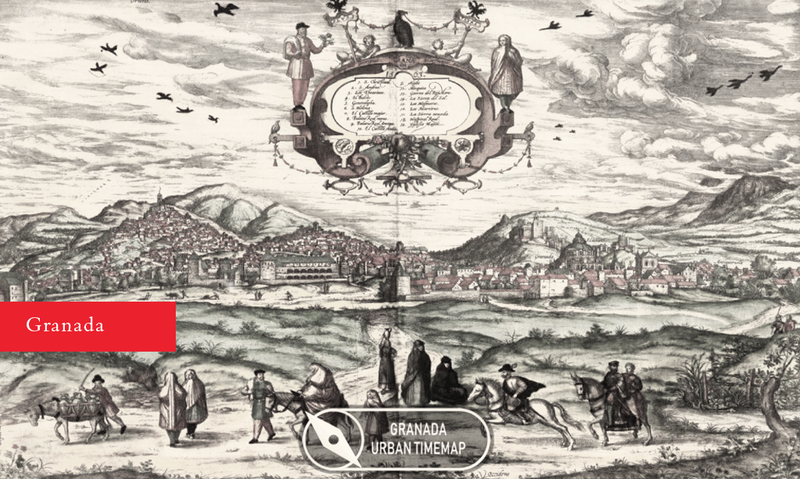 The construction of the church and the Jesuit Collage, founded by Bernard Maciejowski, commenced in 1586. The church designed by Jan Maria Bernardoni was completed in 1625 by the Jesuit architects Józef Briccio and Michał Hintzl. In 1757 Jozef Meyer decorated the interior with polychromes featuring scenes from the Bible. After the dissolution of the Jesuit Order in 1773, the buildings were taken over by the Trinitarian Order. 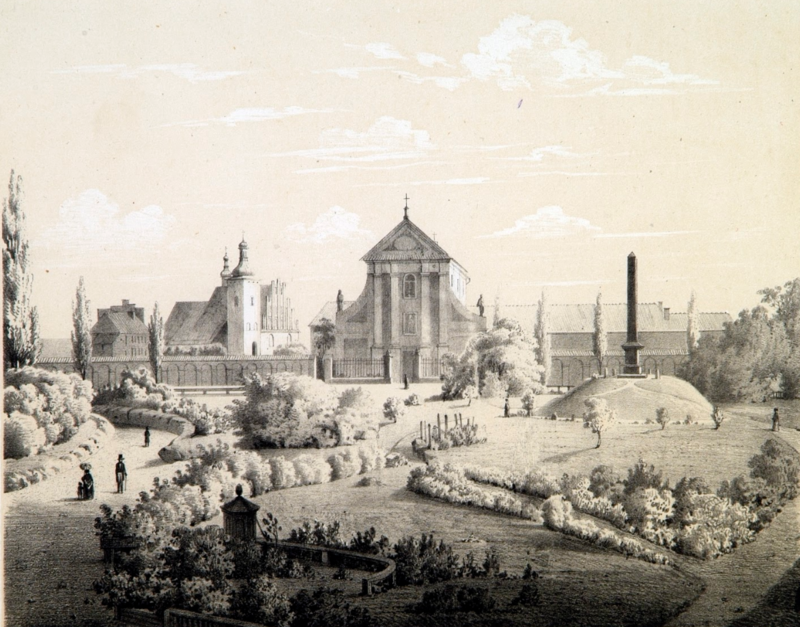 In 1805, when the Lublin Diocese was established, the church became a cathedral. The college complex was demolished making room for today’s Cathedral Square. The facade of the cathedral was remodelled by Antonio Corazzi. The former Jesuit Gate. Present appearance is due to a renovation in 1819 according to Antonio Corazzi’s design. It was formerly a cathedral bell tower. Today the tower houses the Archdiocesan Museum and a roof terrace with panoramic views of Lublin. This former church of Bernardine Sisters was founded by Piotr Czerny of Witowice and was built in the years 1636-1658. It was an oriented, single-nave Baroque building with narrowing chancel. In the years 1736-1739 a tower was added, and Baroque gables were added in the 1770’s. The interior of the church is decorated with neo-Baroque polychromes from 1897 made by the local artist Władysław Brawicki. Since 1920 it has been a Jesuit church. Together with the 13th century keep and the 14th century Holy Trinity Royal Chapel, the castle forms a historic complex on Castle Hill. The castle’s brick building was erected during the reign of King Casmir the Great (14th century). In the years 1823-1826 it underwent reconstruction gaining its present neo-Gothic structure. As a result, the castle become a prison. Today the it houses the Lublin Museum. The chapel was built during the reign of Casmir the Great in the 14th century. The interior of the chapel was decorated with Russo-Byzantine frescoes, commissioned by King Ladislaus Jagiello and completed by Master Andriej in 1418. The original Gothic structure was rebuilt several times. The entrance with the emblem of the Teczyński Family was added in the 16th century, while the Renaissance gable was added in the 17th century. The chapel is honoured with a European Heritage Label as a witness of signing the Union of Lublin. The tower is the oldest brick building on the Castle Hill. Built in the 13th century and rebuilt between the 17th-19th century, it was intended for dwelling and defence purposes. Until the mid-19th century along the axis of Krakowskie Przedmieście and its extension towards the former Korce, new city squares emerged outside the medieval city walls, including one in front of the Jesuit church, by the new town hall, and the military square, which was a predecessor of today’s Litewski Square. In the 16th century, today’s Litewski Square was full of mansions built for nobleman due to the foundation of the Royal Tribunal in Lublin. Most of them were destroyed in the 17th century due to war damages. In the 1820’s an ample square was created by the Russian army next to the Monument of the Union of Lublin and named the Military Parade Square. The current name comes after the Polish-Lithuanian seym dedicated to the signing the Union of Lublin. This neo-classical cast iron monument commemorating the signing of the Polish-Lithuanian Union in 1569 was erected on the site of an earlier brick monument on Stanisław Staszic’s initiative in 1826. The gilded reliefs symbolizing the two countries were made by Paweł Maliński, who was Thorvaldsen’s pupil. The cast was prepared in Samsonów near Kielce. The monument is honoured with a European Heritage Label in connection with the signing the Union of Lublin. The original, 16th century manor house of the Firlej family was rebuilt in the Baroque style in 1683 by Tylman Gameren for the Prince Lubomirski family. In the years 1823-1824 it was converted into the seat of the Lublin Voivodeship Commission according to Józef Stompf and Jakub Hempel’s design. After the fire in 1829 the building was remodelled in a neo-classical style by the Warsaw architect Henryk Marconi. The preserved historical features inside the palace include paintings, wall decorations, tile ovens, and ornamental window and door frames. The city walls of the medieval town were 6 meters high and 2 meters wide. The walls were reinforced by 15 bastions. They were made of limestone with brick battlements, topped with wooden galleries. The walls were surrounded by a deep, dry moat. 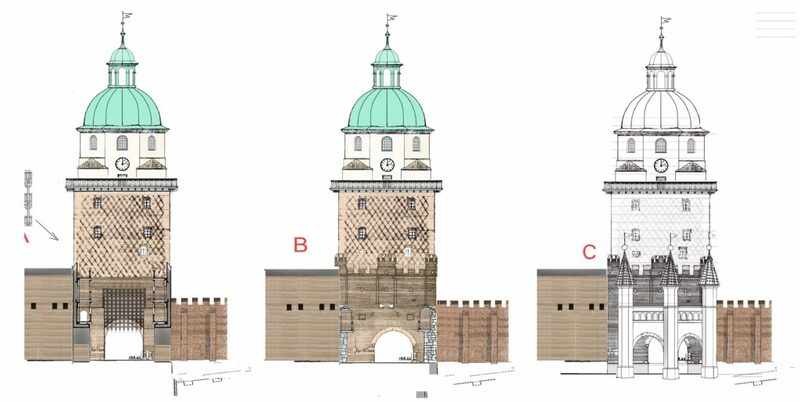 The city had two main city gates – Krakowska Gate from west and Grodzka Gate from north-east. Each gate had a wooden bascule bridge. By 1650 the bastions became higher and the dry moat was filled-up. By 1790 the city walls were demolished. The only remains are the Rounded Bastion in Jezuicka Street. Which other city has the town walls?